Everyday Robots, the first solo album from Damon Albarn, will be released by Parlophone in April 2014. The album was recorded last year at Albarn’s West London studio 13 and is produced by Richard Russell of XL, with whom Damon produced Bobby Womack’s sublime ‘The Bravest Man In The Universe’. 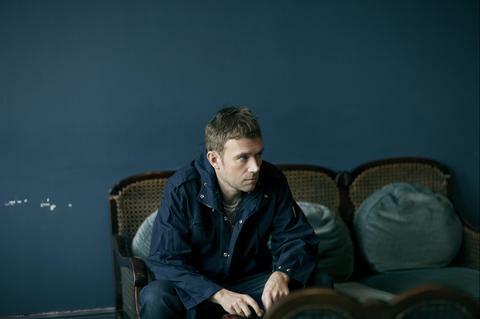 Led by title track ‘Everyday Robots’, the 12 songs here invite the listener into Albarn’s world for a genuine ‘one-to-one’ and are the most soul-searching and autobiographical since his musical journey began: a career that started with Blur and spans Gorillaz, The Good, The Bad & The Queen, Mali Music, Monkey: Journey To The West, Dr Dee and Africa Express. With Blur bandmates Graham Coxon, Alex James and Dave Rowntree, Albarn released seven albums which placed the band at the forefront of Britpop. He is a not-so evil mastermind behind the most successful virtual band ever, Gorillaz, - and the voice of spiky blue-haired frontman 2D – whose four multi-million selling albums contain elements of rock, trip-hop, pop, hip-hop, electronica, and soul. In 2007, he wrote the score for a modern take on an ancient Chinese story, the critically acclaimed Monkey: Journey To The West, and delved deep into the dark psyche of Elizabethan super brain Dr John Dee with his very “English Opera”, commissioned by the prestigious Manchester International Festival in 2011. Albarn also has an abiding love of African music which first bore fruit with 2002’s Mali Music and led to the formation of the inspirational union of cultures that is Africa Express. And he also finds time to be part of The Good, The Bad & The Queen, an outfit underpinned by the drumming of Nigerian afrobeat pioneer Tony Allen and completed by Paul Simonon (The Clash) and Simon Tong (The Verve). Albarn is first to admit he’s a restless soul when it comes to music. Don’t try fixing a label on him. What is certain is that all his previous projects help form this singular artist’s musical DNA. But if you peel back the myriad layers, who owns the beating heart behind them? Where does he come from? What makes him tick? Who is he? Strong narratives are not new to his work but this album is more directly personal than before and is quite clearly about his experiences, from early childhood to now. Ghosts of Albarn’s boyhood in Leytonstone and Colchester walk hand-in-hand with reflections on life and love. He visits recent haunts... under London’s Westway and idyllic Devon... as well as pondering the trappings of our modern existence such as computer games, mobile phones and nature versus technology. Blur’s defining second album Modern Life Is Rubbish - or at least the piece of graffiti that inspired the title - gets a shout-out on the reflective Hollow Ponds. On the inspiration for certain tracks, we learn that Mr Tembo is in fact a baby elephant and that The Selfish Giant is in reality a nuclear submarine, such are the rich narratives and imagery of this intimate, strangely compelling album. Never predictable, always imaginative. The record’s pivotal instrument is the piano but strings, horns, all sorts of effects, subtle beats and soundbites (including American comedian Lord Buckley and controversial drug advocate Timothy Leary) provide a backdrop for Damon’s evocative voice. Continuing Albarn’s inclusiveness, the album also features notable guest appearances from Brian Eno, who adds synths to the richly atmospheric You And Me and elegant vocals to the album finale Heavy Seas Of Love. Then Natasha Khan (Bat For Lashes) pops up with suitably dreamy backing on The Selfish Giant. It’s undeniable that Everyday Robots bears a strong, soulful edge to Damon’s vocals and even a taste of full-blown gospel when Leytonstone’s Pentecostal City Mission Church Choir swing into action on the album’s most upbeat track, Mr Tembo, inspired perhaps by a lifelong love of soul going back to childhood influences including Marvin Gaye, Nina Simone, Ray Charles, as well as gospel artists Mahalia Jackson and his grandfather’s Paul Robeson records. So there we have it. Everyday Robots – the first Damon Albarn solo album – a narrative inspired by his early life that also encompasses our human relationships, living with technology and the uncertainty of this new modern world around us.